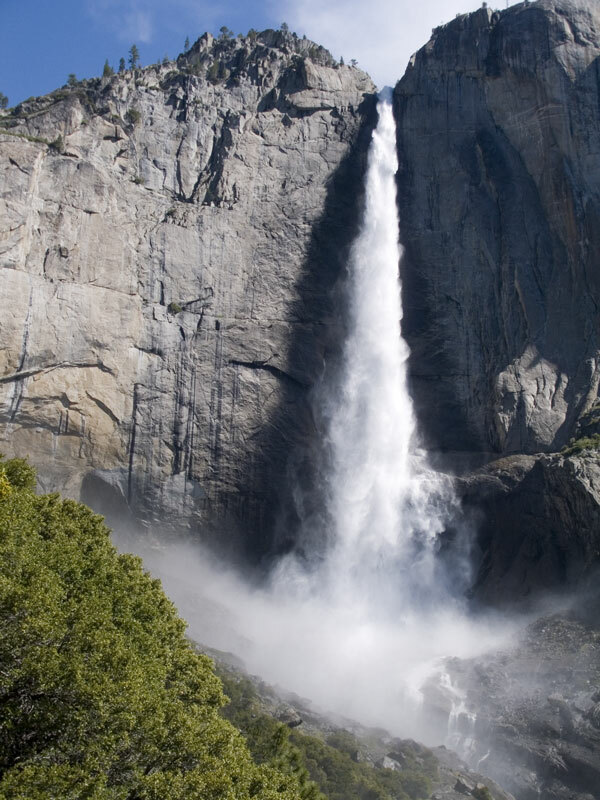 What is the tallest waterfall in the continental United States? If you've ever had the chance to see a waterfall up close, you know what a beautiful — and powerful — sight it can be. Depending on the size and location of the waterfall, thousands and thousands of gallons of water can cascade down the side of a mountain every second of every day. A waterfall is exactly what it sounds like: a place where water falls steeply from a height. Waterfalls form when swiftly moving water cuts through and wears away soft rock through a process called erosion. It can take thousands of years for a waterfall to form. The spot where a waterfall collects at the end of its fall is called a plunge pool. Waterfalls continue to change constantly, although the changes can be hard to see with the naked eye because they occur slowly over time. The waterfalls that exist today will be around for a long time, but they will eventually disappear. As erosion continues, waterfalls keep retreating backward until all that's left is a gorge. It takes just as long for a waterfall to disappear as it did to appear in the first place. For example, Niagara Falls retreats at a rate of about 3.3 feet per year. The tallest waterfall in the world can be found in Venezuela. Angel Falls (called Salto Ángel locally) is more than 3,200 feet (975.3 meters) high with an uninterrupted drop of 2,648 feet (807 meters)—that's approximately half a mile! Angel Falls drops over the edge of the Auyantepui mountain in the Canaima National Park. Angel Falls was unknown to most of the outside world until 1933, when American pilot Jimmie Angel flew over it while searching for valuable ore in the area. The falls were named after Angel. Although it's one of Venezuela's top tourist attractions, a trip to Angel Falls is not your average sightseeing trip. Because the falls are located in a remote jungle area, one must take a flight to a local camp before riding in a boat along a river to the base of the falls. If you want to see a waterfall, though, you don't need to travel around the world. There are probably many beautiful waterfalls not far from where you live. For example, the World Waterfall Database lists nearly 5,000 waterfalls in North America alone. In case you were wondering, the continental United States boasts its own tall waterfalls. Many people consider Yosemite Falls in California to be the tallest waterfall in the United States with a vertical drop of 2,425 feet (739 meters). Others believe the tallest U.S. waterfall is Colonial Creek Falls in Washington, which plunges 2,568 feet (782.7 meters). Unlike the sheer drop of Yosemite Falls, Colonial Creek Falls plunge in 13 different, gradual steps and thus may not seem as impressive to look at as Yosemite Falls. Tomorrow’s Wonder of the Day brings together some of the smallest things in the world! Ready to make your own waterfall at home? Wait! Stop! Put away the hose. We don't want you putting the forces of erosion to work in the backyard. Instead, grab a few craft supplies and make your own Paper Waterfall at the kitchen table. You can make your own version of Angel Falls or you can create your own waterfall scene that's uniquely yours. There's an even easier version of the craft for younger children. If you prefer to view your waterfalls without any mess whatsoever, put together some online jigsaw puzzles featuring waterfalls with National Geographic's Waterfalls Puzzler activity! Ask a friend or family member to help you. Which waterfall do you think is the most beautiful? Why? Waterfalls actually come in different types. Did you know that? Check out Waterfalls 101 online to learn more about what types of waterfalls there are in the world. Which type is your favorite? Have you seen more than one type of waterfall? Can a waterfall be a combination of types? Why or why not? This was really cool! I learned a lot of new things. maybe i could go visit it! Is there any more info. on waterfalls? Wow! That sounds awesome! We bet your family had A LOT of fun! They are truly amazing and awesome to Wonder about! Thanks for sharing, Lh! I have actually been to 2 waterfalls! Niagra Falls in NY! Tahquamenon Falls, MI was great to! Have you guys been to any waterfalls? Collectively, the Wonderopolis team has seen a few different waterfalls. Big or small, they are AMAZING! This is so awesome I learn something new everyday im reading on here. That is the absolute BEST news to hear!!! We LOVE learning new things every day and we are glad you do, too! Indeed it is! Glad you checked this one out, Lucas! Good guess, Jeff! Did you find the answer in the article? Something interesting I learned today was erosion. Another thing I learned was that waterfalls continue to change constantly, although the changes can be hard to see with the naked eye because they occur slowly over time. I think it is interesting that it can take thousands of years for a waterfall to form. The spot where a waterfall collects at the end of its fall is called a "plunge pool." how do they measure the height of the falls? I wish they had something about gymnastics! You should really put a bunch of facts about titanic on here! I know tons so if you need some then ask me I know all facts? Are you ever going to put facts on? Why do you need our email address? A place where water falls steeply from a height is called a what? The spot where a waterfall collects at the end of its fall is called a what? The tallest waterfall in the world can be found in which country?